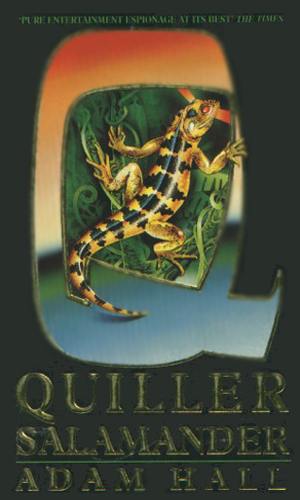 Quiller is an agent for The Bureau. The first line of action known about Quiller was the time spent during the latter months of the war behind enemy lines, masquerading as a German soldier assigned to several concentration camps, working in reality to free as many of the condemned Jews as he could. When the war was over and his activities made known, he was offered medals from several countries for his bravery but rejected them all out of frustration for not having saved more. Shortly thereafter, Quiller was recruited by the Bureau, an organization that 'didn't exist' because, as is explained many times, if it did exist, it couldn't do the things it was needed to do. In the Bureau, the people also didn't exist. Their real names are never mentioned and are only recorded in the files of the upper echelon. No facts about the personal life of the agents became known. Quiller was only the cover name given to this agent. Since it was only a cover, it didn't matter whether the name was a first or a last. 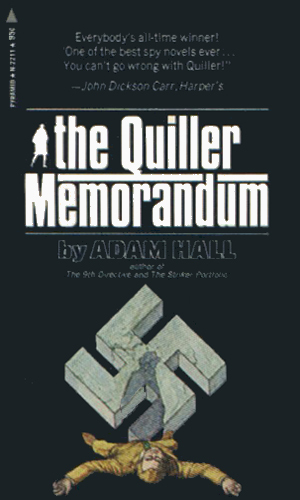 In the first novel, Quiller's adversary, in recounting what was known about the British agent, stated, 'You are a known authority on memory, sleep-mechanism, the personality patterns of suicide, fast-driving techniques and ballistics.' These are just a few of the areas of expertise that allows him to survive all the years in the Bureau. Quiller-9 is the full designation for this agent. The 9 suffix is assigned to the few executives who have been designated 'reliable under torture' and therefore not required to carry the cyanide pill that would ensure security. Quiller laments that, unfortunately, the only way to get such a label is to have actually proven the point, not a pleasant way of earning it. 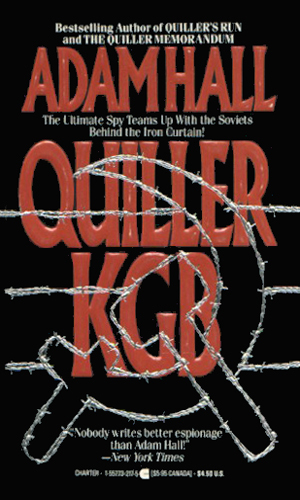 Quiller is an anachronism is the spy business, not only in the Bureau for whom he works but also in the entire field of spy-hero fiction. He doesn't like guns. It isn't that he is bad with them for he has quite a good aim and a superb knowledge of the attributes of most weapons. It is that he feels carrying a gun would make him prone to rely on it and use it when thinking would be a better choice of action. This lack of firepower has gotten him chided on more than one occasion but it has also bewildered adversaries who cannot believe that he would not have a gun. The lack of a firearm, however, does not indicate passivity. 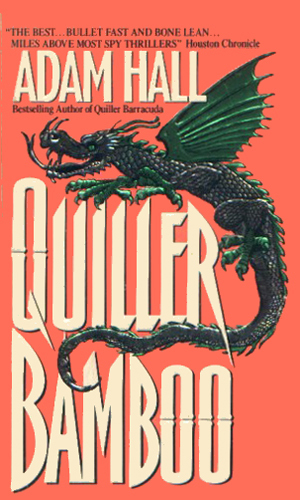 Quiller is highly skilled in the martial arts and the hand-to-hand combats that are described in his adventures are probably the best written and most believable to be found in any series. He is no superman but he is good. The group called Phonix is a Nazi organization, still operating out of Berlin many years after the end of WWII with the goal of protecting former war criminals. Quiller's task is to locate the headquarters but he wants to catch one man, Heinrich Zossen. The upper levels of British Intelligence receive word that 'the Person' was in danger of assassination during his trip to Thailand, one of the directors of the Bureau volunteers his agency to stop the killer. Quiller is given the key role. 'The fly fell down.' This cryptic remark is made by Quiller when he is sent to a hillside in Germany and told to 'observe'. 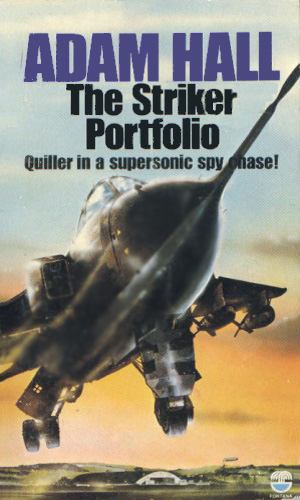 Not knowing for what, Quiller notices a speck in the sky he decides is a NATO Striker aircraf. At the huge altitude it flew, it was like a fly. And then the aircraft turned downward and promptly crashed. Fresh on the heals of a Soviet invasion of Czechoslovakia, the tension in Poland is palpable with dissidents rioting in the streets and Soviets with tanks near the border. 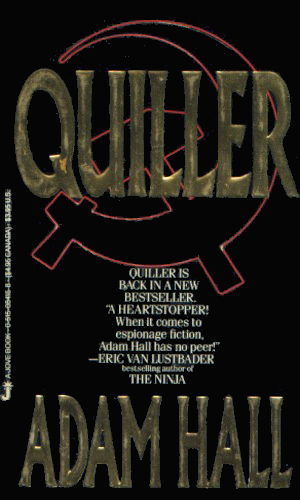 Quiller's mission is to break in a young agent who is trying to find out who is behind the potential uprising. When the plane, with call letters 'Tango Victor', flying from England, crashes in the Sahara, the whole of the Bureau goes into major activity. This includes pulling Quiller from an assignment in Tokyo with a 'Most Urgent' directive to find and investigate the crash site. Note: This is an AWESOME book. A high-speed car chase in the streets of a North African city is one of the best you'll ever find. Best of all is the ending. 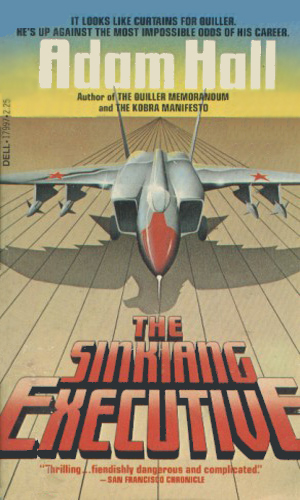 It has to rank as one of the very best ending in all of spy fiction! 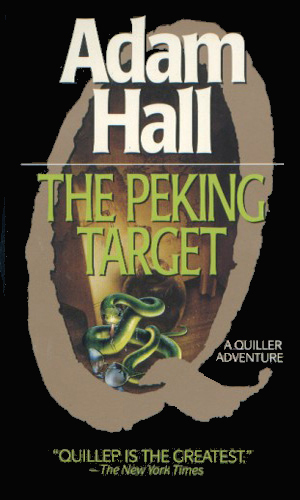 They keep telling Quiller that the mission to Hong Kong is just a routine investigation - something to do while he is waiting for the real mission into China to begin. His distrust is proven correct and he is suddenly in the middle of a mess with people trying constantly to kill him. 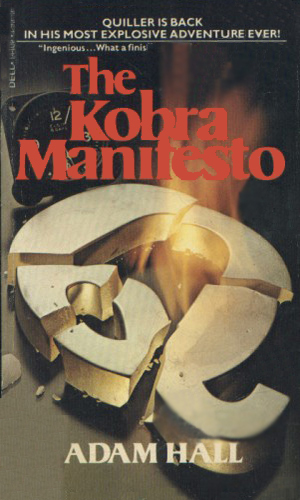 Kobra is a gang of terrorist assassins. They include some of the very best and most feared of international killers and they are up to something big. When the Bureau sends in several different executives to follow and watch the members of this organization, each of the executives dies in an abrupt manner and the target disappears. Now it is Quiller's turn. The man on the subway was someone from out of Quiller's past. He was someone who had once chased Quiller, almost killed Quiller, and when Quiller escaped, took his revenge out on a young woman that should have been safe. Now, years later, he was on the same subway car in London with Quiller. When Quiller left the train, however, the man did not. Then trouble begins. When Shrenk, a fellow executive working for the Bureau, went missing, it sent up far more flares that seemed normal. And the questions were even more confusing. Was he captured by the KGB or not? Was he in Lubyanka Prison or was he walking around free? Quiller is sent in to answer those questions. The mission started with the assassination of two high level diplomats, one English and the other American, while on official business to the People's Republic of China. During the same time frame, at least two agents for the Bureau are removed from life, taking with them the reasons for the attacks. When an American spy submarine is blown up on patrol off the coast of northern Russia, the world moves to the brink of war. The Prime Minister has proof the attack was the result of an over-anxious Soviet officer and not an act of aggression by the government but her proof explodes outside 10 Downing Street. Angered that he had been set up by his own Bureau to die as an expedient way of ending his previous mission, Quiller quits. Then a job with DI6 comes along. Quiller heads to Cambodia and is soon being hunted by mysterious assailants. Note: this book is fantastic! It has a tremendously powerful enemy who remains wonderfully in seclusion until the end, building up a mystique and making the final confrontation delectable. This one is an absolute treat. Imagine if you had worked all your adult life fighting a regime and what it stood for, only to be told that in the interest of peace you must work with them. That is what happens to Quiller. The mission is to stop a murder of a major member of Soviet government by a British citizen in East Berlin. The mission was not fully established when Quiller is sent to Miami to meet with a sleeper agent, named Proctor, and to bring him home. The rumors of the agent's actions are enough to make the Bureau fear that Proctor may be over the edge, mired in addiction to drugs but Quiller finds a scheme involving a major US Presidential candidate and the KGB. It is not often that Quiller takes such a personal interest in an assignment but this one brings the hope of millions for the freedom they have been lacking for decades and Quiller can help it succeed. There is a plan underway to bring down the Communist government of China and institute democracy. Nemesis is the name of a select group of terrorists, hand-picked by their leader from the best that the Red Army Faction of Germany can offer. It and its founder, the charismatic but highly deadly Dieter want to make a statement that will keep them remembered for a hundred year. He was on vacation in Rome when they called him, only just coming down from the stress of his last mission. The word was that 'Mr. Croder would be grateful' and that meant it was very serious. Something had come unglued in Bucharest and he was needed. Many weeks have passed since his last mission and Quiller is literally begging for an assignment. The one given him is under the most hush-hush nature that he had ever encountered and that tells him something is not right. The mission takes him to Cambodia amid the ruins left by the disposed Khmer Rouge. This book has a great ending. 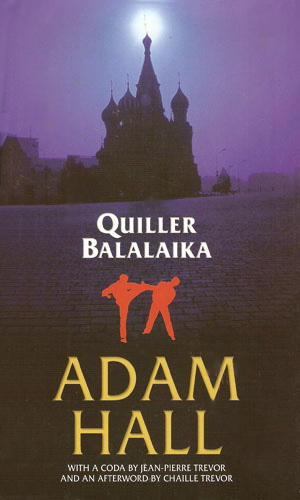 Quiller's assignment is to stop a Russian mafiya leader from wresting power from Yeltsin and destroying any chance to democracy. To do this, Quiller needs the help of a man stuck in an escape-proof gulag. Quiller takes a vacation aboard the Queen Elizabeth. The death by heart attack of a man he remembers as a CIA agent gets his attention. Regrettably, one of the greatest spy series ever written has but one movie made from it (as far as I currently know) and it starred an American as the British operative. The movie was quite good, imho, especially for the delicious performance by Sir Alec Guinness as Pol. Throwing in Max Von Sidow is never, ever, a bad thing and the delectable Senta Berger can charm any male. The writing was first rate, earning Harold Pinter an Edgar nomination. 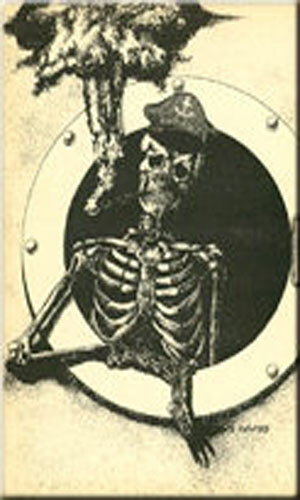 The reason it did not do so well, I think, is it was like the book, very cerebral and requiring the viewer to think. Not enough car chases or things blowing up. Since that is the sort of thing I look for in movies, I'm surprised I enjoyed it so much. The murder of a British agent in Berlin brings Quiller to find out why. His control tells him of a rising neo-Nazi movement he must uncover and help bring down. In the summer of 1975, the BBC presented a new series about Quiller, the agent for The Bureau. 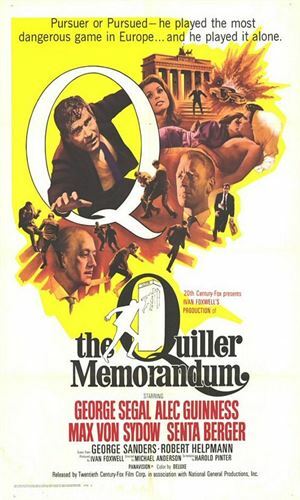 Starring in the series as Quiller was an accomplished actor, Michael Jayston who would, a couple of years later, play Peter Guillam working with Alec Guinness' George Smiley (noteworthy in that I consider the two series to be among the very best ever created in spy series fiction). The show did not survive long and after its last episode, it went into the vault and did not get any form of syndication. So far I can find no place selling any of the episodes. A VIP is heading to England but so is an assassin to take him out. Quiller is assigned protection duty. After a secret plane crashes in the Sahara, Quiller is sent to make sure the cargo is destroyed. Quiller is ordered to help a man escape being shot by a firing squad while still making it look like he has been shot. A woman's kidnapping can have major international repercussions if Quiller cannot get her free. 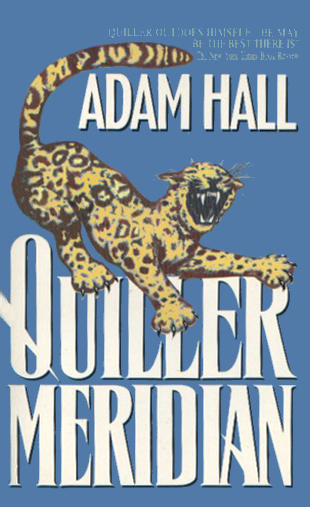 To uncover a plot, Quiller must take the role of a mercenary. Quiller must take on the voodoo community to find out what is behind a spate of bad trouble. A British governmental Minister is killed by a bomb while skiing. 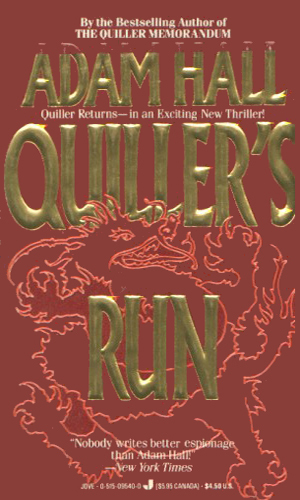 Quiller must find who and why. There is something very odd going on at a 'members-only' club and Quiller is told the check into it. 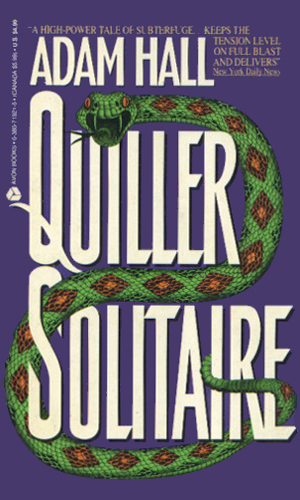 Quiller is sent to help a political prisoner escape captivity but finds instead the person would prefer to remain incarcerated. Weapons marked as secret have disappeared from a British base in the Mediterranean and Quiller is sent to locate them. Quiller must deal with rapidly changing conditions when helping a British defector return to his homeland. It is while searching for a missing US Army Colonel that Quiller comes upon a scheme to cause destruction in London. The loss of an agent in Berlin is the reason Quiller heads there to find out who caused it. 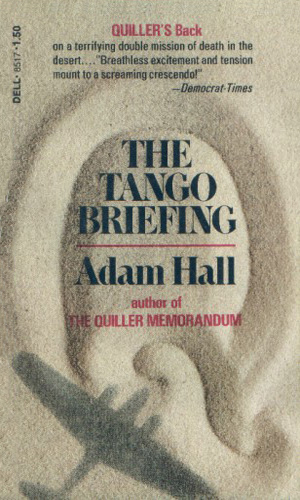 Adam Hall is a novelist who writes spy fiction. These books are first and foremost novels. This may not have opened the floodgates of fans anxious for an Executioner style 'love 'em or blow 'em up' book but it does make for fantastic enjoyment and many hours of great reading. Quiller is a totally believable character. He has fears (he hates snakes and isn't too fond of heights), loves (most missions start with a bequeath of 'roses for Moira'), and dedications (why else put up with the s**ts at the Bureau). He makes a good number of mistakes but they are understandable and reasonable and when someone dies as a result, he suffers the guilt that should come. We never know how tall he is or what color his hair is or where he is from. We never know what his real name is. There are tons of information we don't know about Quiller. But with all that we don't know, it is certain that we do know him. In 1966, the first novel in the series, The Quiller Memorandum, won the Edgar Allan Poe award for best novel. It also won the Grand Prix de Litterature Policiere in the same year. Also in 1966, the movie of the same name was released to theaters. Quiller was played by George Segal, his control Pol was acted by the incomparable Alec Guiness, and his adversary Oktober was the gifted Max Von Sydow. The luscious Senta Berger played the luscious Inge (both the actress and the character deserve the adjective). 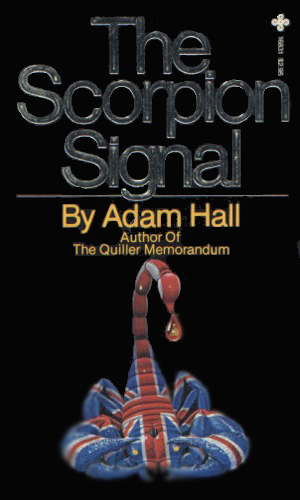 With the Quiller series, the late, great Ellestor Trevor - writing as Adam Hall -created a whole spy world resplendant with it's own dialogue and discriptions of trade craft that remained constant throughout the whole series. The result was that immediately you opened each new book, you were completely immersed into Quiller's world and what an exciting world it was. 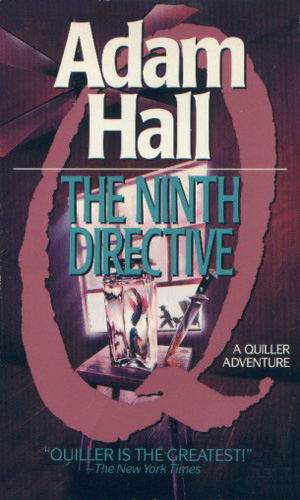 For me, the best in the series was " The Ninth Directive". A story about the hunt for an assassin. It is really quite brilliant and was equally as good as " The Day Of The Jackal". A book that it proceeded. I've often wondered why Quiller didn't get more acclaim. 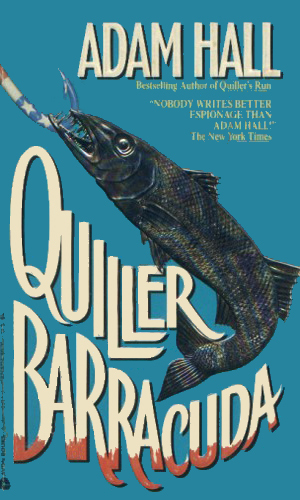 I would pick the Quiller series as my personal favorite of all the characters and series listed on this website. I have great respect for John Le Carre's works, but I think the Quiller novels represent the best blend of intrigue, action and spy-craft. The character Quiller, speaking in the first person, let's us inisde his mind and we feel his fears and sometimes despair. The world that Trevor creats around Quiller is highly believable. 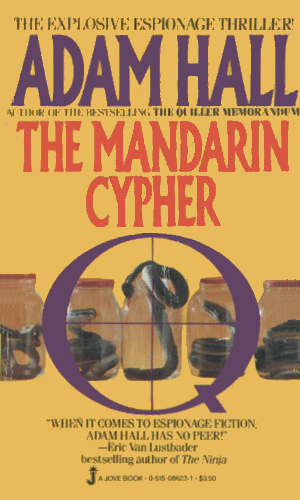 I think my favorite among the novels are The Mandarin Cypher and The Tango Briefing. 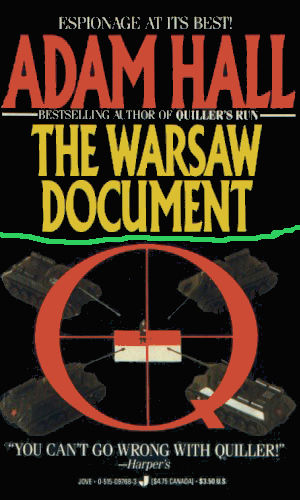 Like most spy series, I think the novels that followed the end of the Cold War were less intriguing, but still well written.